Defending champion Chris Froome moved up one place to ninth, 19 seconds behind the leader, after stage two of the Tour of Romandie in Switzerland. The 2013 Tour de France winner, making his competitive return this week after recent illness and injury problems, finished 10th in the 166km stage. In rain-hit Montreux, Michael Albasini won a second successive sprint finish. A 10-second time bonus took him above prologue winner Michal Kwiatkowski of Poland into a five-second lead overall. "Winning two stages in a row is just fantastic, said Orica GreenEdge rider Albasini. "It's been a really good day for us." Froome is expected to play a more significant role in Friday's third stage, a 180km run in the mountains from Le Bouveret to Aigle. 1. Michael Albasini (Switzerland / Orica) 6:29:50"
2. Michal Kwiatkowski (Poland / Omega Pharma - Quick-Step) +5"
3. Ramunas Navardauskas (Lithuania / Garmin) +10"
4. Jesus Herrada (Spain / Movistar) +11"
5. Matthias Braendle (Austria / IAM Cycling) +12"
9. 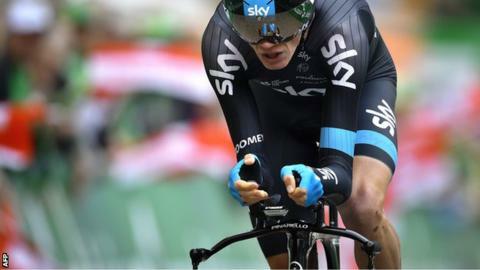 Chris Froome (Britain / Team Sky) +19"